Cooking with unfamiliar ingerdients can be a challenge since you don’t know what to expect. Perhaps there will be unforseen complications in the cooking process. More common, at least for me, is the fact that it can be difficult to season something when you don’t know what it’s natural flavor is. You can always slather on some sort of thick, cheesey sauce, but if you’re planning on doing this you would be better off not bothering to use any unsusal ingredients because you won’t be able to taste them anyway. Quinoa, pronounced “keen-wa”, is a south american grain. You can read more about it here. I had never cooked it before and bought it more or less on impulse. I didn’t really know what to do with the small, hard grains that resembled a cross between steel cut oats and couscous. I decided that a warm salad would be the best option since it would allow me to taste the quinoa relatively plain. 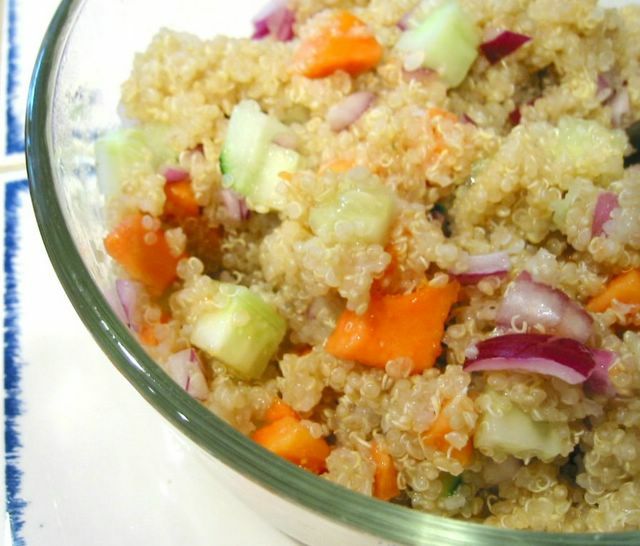 Quinoa turns out to be very simple to prepare. Boil one cup of quinoa in 2 cups of water. Reduce heat to a simmer and cover until liquid is absorbed, about 15 minutes. I don’t know if you can see in the photo above, but the grains sort of open an unwind as you cook them. I tossed it with cubed red onion, cucumber, papaya and salt and pepper to make a very simple warm salad. It turns out that quinoa tastes a lot like nutty brown rice, but with more of a creamy texture. Next time I’ll do something more interesting with it, but I’m glad to say that there will be a next time. I love quinoa! I’m glad you found this grain…I think you will really enjoy it. Your salad looks very tempting. Oh, thanks, Jennifer. That salad recipe from your site looks tempting. I think I’ll be using it more often in the future! oh, thanks so much for posting this! I’ve been wanting to buy some quinoa but I haven’t had an idea of where to start. A warm salad sounds like a great idea. Nic, thanks so much for going to the trouble not only to try new things, but to report (with photos!) on your trials. You make life easier for a lot of folks. Anne and dskbook – I’m glad that this is useful! One of the reasons I love food blogs is that they’re great for inspiration, so I’m glad to contribute (and not just leech everyone else’s tasty recipes! – Just kidding). Snake in fall – I’m glad you’re enjoying the blog. You forgot something: quinoa should be washed (like you do when making rice for sushi) several times till the water runs clean, and then you can cook it. 😉 I live in Chile, where the grain grows naturally, but I didn’t know it till last year…quinoa is getting big here!